Free shipping. Buy direct from HP. 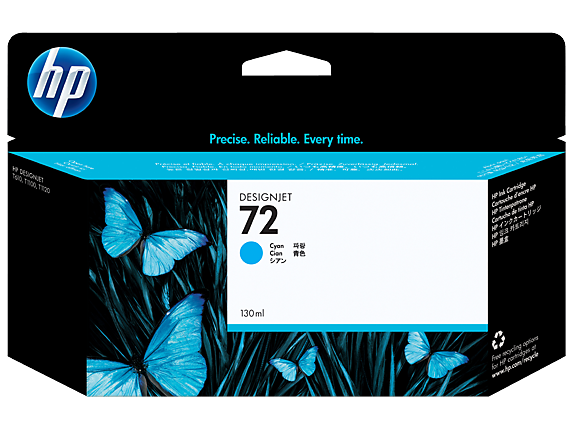 See customer reviews and comparisons for the HP 72 130-ml Cyan DesignJet Ink Cartridge. Upgrades and savings on select products. Original HP inks produce crisp text, fine line accuracy, true neutral grays, and vivid color.Fast-drying Original HP inks enable fast print speeds and produce prints that resist smudging. Intelligence built into Original HP ink cartridges provides alerts when supplies need to be replaced.Choose from 2 sizes of each color: 69-ml or 130-ml HP 72 Original HP Ink Cartridges.It's easy to identify and install the individual ink cartridge color you need to replace.Free, convenient return and recycling in 42 countries. Visit www.hp.com/recycle for details. Intelligence built into Original HP ink cartridges provides alerts when supplies need to be replaced.Choose from 2 sizes of each color: 69-ml or 130-ml HP 72 Original HP Ink Cartridges.It's easy to identify and install the individual ink cartridge color you need to replace.Free, convenient return and recycling in 42 countries. Visit www.hp.com/recycle for details.